where X’ is the normalized dataset, X is the original dataset, and x̅ is the mean of X. Standardization is used to put all features on the same scale. Each zero-centered dimension is divided by its standard deviation. where X’ is the standardized dataset, X is the original dataset, x̅ is the mean of X, and σ is the standard deviation of X. Looks good. You can see that the scales are the same and that the dataset is zero-centered according to both axes. Now, have a look at the covariance matrix. You can see that the variance of each coordinate — the top-left cell and the bottom-right cell — is equal to 1. This new covariance matrix is actually the correlation matrix. 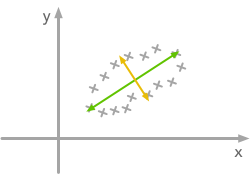 The Pearson correlation coefficient between the two variables (c1 and c2) is 0.54220151. Whitening, or sphering, data means that we want to transform it to have a covariance matrix that is the identity matrix — 1 in the diagonal and 0 for the other cells. It is called whitening in reference to white noise. Here are more details on the identity matrix. This refers to mean normalization (2. A). Check back for details about the center() function. The left plot shows correlated data. For instance, if you take a data point with a big x value, chances are that the associated y will also be quite big. Now take all data points and do a rotation (maybe around 45 degrees counterclockwise. The new data, plotted on the right, is not correlated anymore. You can see that big and small y values are related to the same kind of x values. The question is: how could we find the right rotation in order to get the uncorrelated data? The eigenvectors of the covariance matrix give you the direction that maximizes the variance. The direction of the green line is where the variance is maximum. Just look at the smallest and largest point projected on this line — the spread is big. Compare that with the projection on the orange line — the spread is very small. For more details about eigendecomposition, see this post. We can see that the correlation is not here anymore. The covariance matrix, now a diagonal matrix, confirms that the covariance between the two dimensions is equal to 0. The next step is to scale the uncorrelated matrix in order to obtain a covariance matrix corresponding to the identity matrix.To do that, we scale our decorrelated data by dividing each dimension by the square-root of its corresponding eigenvalue. Note: we add a small value (here 10^-5) to avoid division by 0. Hooray! We can see that with the covariance matrix that this is all good. We have something that looks like an identity matrix — 1 on the diagonal and 0 elsewhere.